It’s been a bit of an odd summer. We rang in Memorial Day with a non-traditional trip to Alaska where the weather was more like March than May. Then came the excitement of meeting the newest member of our family when my brother and sister-in-law welcomed their first baby, an adorable boy named James. He’s precious and already dearly loved by his aunties and uncle Mike. In the meantime, I actually have been cooking a ton and making deep dives into the amazing produce that summer brings; I’ve just been incredibly neglectful of this space! I’ve become a bit obsessed with certain ingredients lately and I’m afraid to even begin sharing all the rhubarb related baked goods and tomato-laden salads that have come out of my kitchen in the last few weeks. As a slow start I’ll share this one – spicy pan-seared flank steak thinly sliced and served with a bracingly fresh cilantro, lime, and jalapeno spiked salsa. It rocks that strange place where a cool temperature meets a heated flavor profile and it’s dead easy to throw together last minute and have dinner on the table in 30. Shuck the ears of corn and cut kernels from cobs. Heat 1-2 teaspoons of olive oil in a medium sauté pan over medium-high heat and sauté the corn for 4-5 minutes or until lightly caramelized. Place in a medium bowl and allow to cool. Add the onion, jalapeño, tomatoes, cilantro, and lime juice to corn and toss to combine; season with salt and pepper. Set salsa aside to allow the flavors to develop. Note: Salsa can be made 1 day ahead if covered and chilled. Prepare the dry rub. Combine brown sugar and spices in a small bowl. Just before searing, coat both sides of the steak with all of dry rub mixture pressing lightly to help the rub adhere. Heat a small drizzle of olive oil in large sauté pan over medium-high heat until the oil coats the pan and just starts to smoke. Sear the steak 3-4 minutes on each side. Don’t fuss with the steak while it’s cooking, set a timer if need be to resist the temptation to move it around in the pan. When an instant read thermometer reads 130 degrees in the thickest part, remove to a cutting board and allow the meat to rest for 10 minutes. Slice against the grain and serve with the salsa. 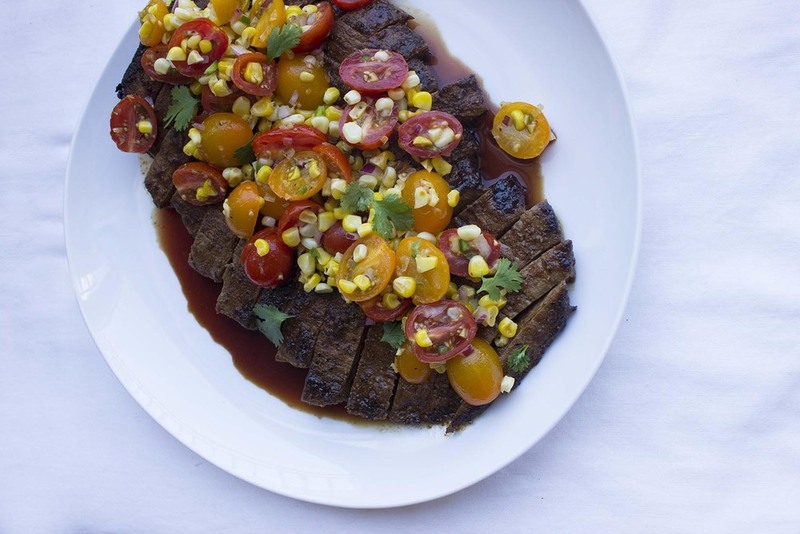 Rewritten and adapted from Dry Rubbed Flank Steak with Grilled Corn Salsa by Brian Luscher of Luscher's Red Hots, Dallas, TX via Bon Appetit Magazine. Absolutely. I used a 10” stainless steel sauté pan, medium cutting board, large mixing bowl, small mixing bowl, chef’s knife, spatula, tongs, and measuring spoons. It’s fully dark by five-thirty these days, but thankfully New York City has put on its holiday glitter to compensate and my evening walks with Maddie have been transformed into a stroll through twinkle lights and piney tree lots. I’m fairly sure that the powers that be scheduled Christmas for December knowing we’d need a little boost when the thermometer drops and the sun sleeps a little longer. Even holiday food seems determined to balance out the chilly temperatures with extra pizzazz and flavors like cloves, ginger, cardamom, and cinnamon to warm the spirit. The moment I spotted these cookies in a Bon Appétit round-up, I knew they were destined for this year’s baking extravaganza. What better form to deliver the sweet heat of cinnamon and cardamom than a soft molasses cookie sparkling with coarse sugar? The double bonus is that they couldn’t be simpler and I’d be willing to bet that 95% of the ingredients are already in the pantry, which means you’re just a quick stir away from filling the house aromatic good-cheer. What are you waiting for? Place oven racks in lower and upper thirds of oven and preheat to 375 degrees F.
In a medium bowl, sift together the flour, baking soda, cinnamon, ginger, cardamom, and salt. In a separate medium bowl, whisk the egg, butter, granulated sugar, molasses, and brown sugar until well combined. Add in the dry ingredients to the wet ingredients and mix until just incorporated. If the dough is sticky, cover in plastic wrap and refrigerate for 20-30 minutes until firm and easy to handle. Place the raw sugar in a shallow bowl and line two rimmed baking sheets with parchment paper. To form the cookies, use a cookie scoop or tablespoons to portion the dough and roll into 1 inch balls. Roll each ball in the coarse sugar and place on the baking sheets, spacing 2 inches apart. Bake the cookies for 8-10 minutes, rotating baking sheets halfway through, until cookies are puffed, cracked, and just set around edges. Overbaked cookies won’t be chewy. Cool cookies on wire racks. Do Ahead: Cookie dough can be made and rolled into balls 2 weeks ahead. Freeze on a baking sheet; transfer to zip top plastic bags. Let sit at room temperature 30 minutes before rolling in sugar. Re-written and adapted from Alison Roman’s Chewy Molasses Cookies for Bon Appétit. Definitely. I used a medium mixing bowl, small mixing bowl, and a small shallow bowl. I also needed two rimmed baking sheets lined with parchment paper (or reuse one), a rubber spatula, cookie scoop, a liquid measuring cup, and dry measuring cups and spoons. 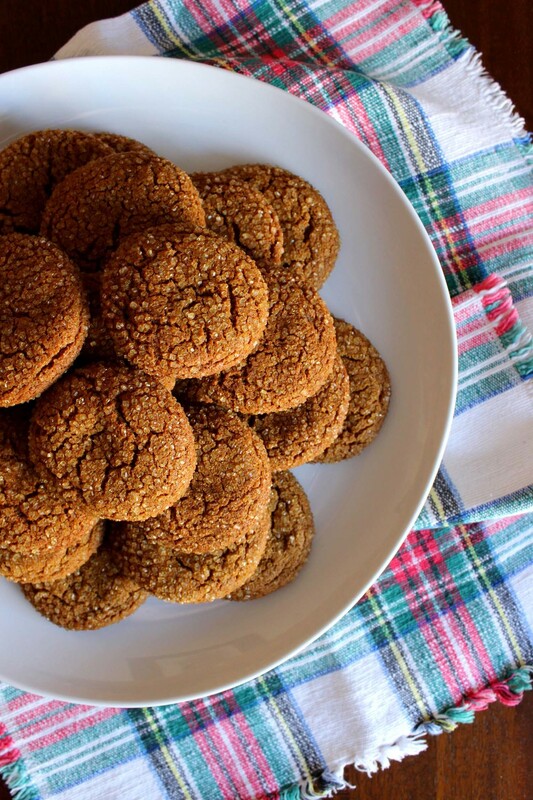 These cookies are beautifully crunchy and crisp on the outside while the interior remains soft and deeply spiced, like the soft-bellied kissing cousin of the ginger snap. The simplicity of the ingredients and process belies the complexity of texture and flavors, which is a win in my book. I also have a feeling that these would be a crowd pleaser - especially my father, who loooooves anything gingery, would be a very happy camper with a few of these babies and a glass of milk.